Dan raising the quarantine and courtesy flags as we near American Samoa. As we made our way through the islands there is one place we really didn’t plan on stopping and that was American Samoa. We’d read a lot about all of the possible places and we hadn’t really heard good things about American Samoa. For one, we heard it was dirty and the anchorage was full of garbage. Other cruisers talked of bringing up old mattresses and plastic children’s pools with their anchors. There were two main positives according to what we read. One is that the people are amazing and the other is that you can have parts shipped there very cheaply from the states because it’s an American territory. Well, since our water maker needed parts we obviously had them shipped there and after just a few days in Suwarrow we headed out to Pago Pago. (By the way, in American Samoa it’s pronounced Pahngo Pahngo. And Samoa is pronounce SAH mo ah, not Sa MO a as we’ve learned in the US.) It did take a bit for that to get changed in our speaking but we do like to speak as the locals do when we arrive somewhere so we do our best. How could I be this close to Charlie and not get my picture taken with him? 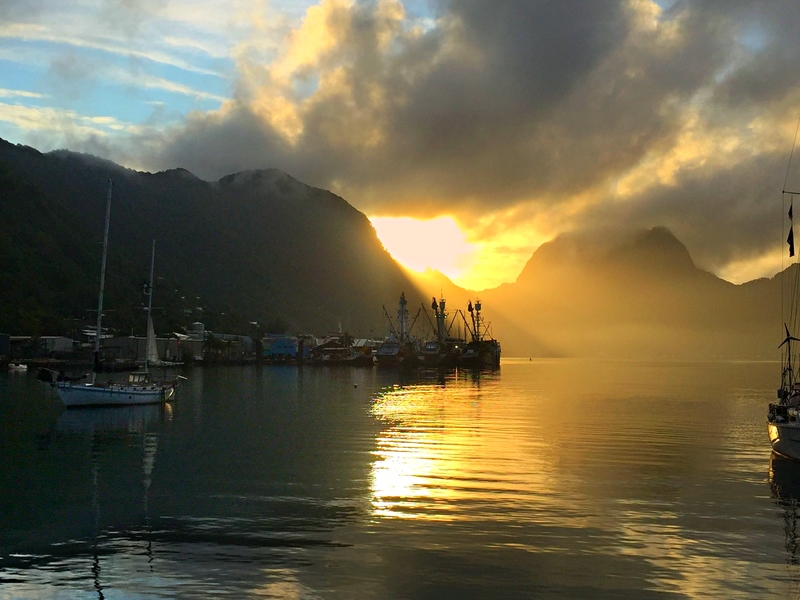 We arrived in Pago Pago Harbor early in the morning. The sun was just coming up over the mountains. Once we entered the harbor it was as flat as glass and absolutely beautiful. The first thing you notice after the view is the smell. The Sunkist Tuna factor is right on the water and every so often it lets steam out which smells like rotten fish. Okay, not the best part of American Samoa but we could live with it. Knowing what we knew about the possibility of trash in the anchorage we were very cautious to make certain our anchor was well secured. On what we weren’t certain but it appeared to be holding steady. After our traditional anchor down beer we decided it was time to head to shore. This is almost embarrassing but our first stop was the McDonalds on the waterfront. We both had a sausage McMuffin and have to say it was delightful! From there we checked out the town and headed to the post office to see if our parts had arrived. This is really something here. If you are waiting for a package you go to the back door of the post office. They let in 8-10 people at a time. When it’s your turn you hand your ticket over to the mail person and they bring you your package. From there you hand it over to Customs who then opens it and asks you a few questions about its contents. The crazy part is you are literally inside the bowels of the post office at this point. You’d never see this in the U.S. They’d be afraid someone was going to “go postal” and start tearing up the joint. Only one of the packages we were waiting for was there and it wasn’t our water maker parts. Since the mail plane only comes in once a week we knew we were going to be here for several more days at least. As it turned out there was a hurricane in Hawaii the following week so we ended up in American Samoa for 17 days. The thing is that during those 17 days we came to truly enjoy this place. The people are so kind and generous. We spent as much time as possible getting to know everyone from our servers in restaurants to the shopkeepers and even the kids. The kids, yes, even the kids are so unbelievably respectful and courteous. One day we passed this young boy, maybe 8 years old, as we were out walking. He was lying down on a bench waiting for his parents to finish their business and when he saw us he sat up tall, straightened his shirt and gave us a proper hello. We were blown away! And even on the buses the teens would help us with directions and chat with us like grown ups. They weren’t sitting there with phones in their hands ignoring the world. Sonny, our bartender at Sadie Thompson’s. The Chef @ Sadie Thompson’s Inn. Cooked one of the best filet and crab dinners I’ve ever had. And to think 2 years ago he was hired as their dishwasher! Tofi, one of the great servers at Paradise Pizza. Speaking of buses, they are very cool here. It seems they are all pretty much the same shell with the basic hardwood seats inside but they are painted completely different and each driver customizes the interiors as well. Some have fur lined dashboards with crazy feather things hanging from the ceiling. Others have crosses and statues of the Virgin Mary and yet others have flat screen TVs playing music videos. No two were the same! While we were here we had a custom-made shirt made for Dan and dress for me. Both are of the same fabric. That’s a huge thing in the islands and we wanted to take part in that tradition. Here more than anywhere else we had been we noticed crypts in front of the houses. Sonny, our bartender at Sadie Thompson’s Inn, explained that this is the Samoan way of keeping past relatives close to the family. They believe that if you have the grave on the family land it will generate questions from children who may not have known that person. That makes the family talk about them and the children are always being reminded of their family and their roots. One guy even told us he sleeps on his father’s crypt at night. He does it especially when he’s got problems or feels he needs guidance. After two weeks our water maker parts finally made it and Dan was able to get it back working properly. That was a relief and left us ready to get on to new places so we set about doing some provisioning and prepared to head out to Niue. The provisioning here was spectacular as we found lots and lots of our American brands and for the first time since we left México beer and liquor was available at a decent price. So, all in all we found American Samoa to be a wonderful place full of truly good, kind people and we were glad we made the stop.